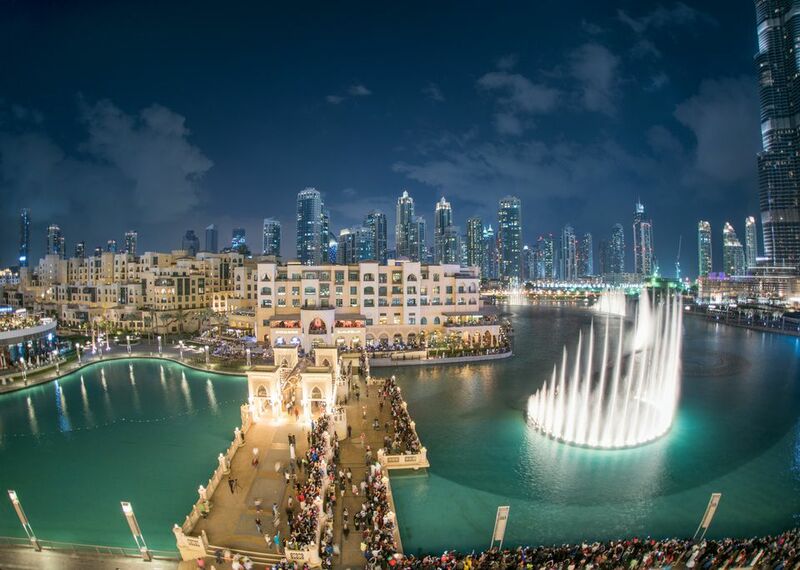 Dubai is one of the world's top tourism destinations. In 2016, nearly 15 million tourists stayed at least one night in the city, which is pretty remarkable when you consider that the population of the city is only 2.8 million. In fact, Dubai's tourist-per-resident ratio is more than 5 to 1—by far the highest in the world. If you've visited Dubai recently, you've almost certainly been struck by crowd sizes, and have certainly noticed a gradual increase if you've visited many times over the past several years. This is particularly true at the following attractions, which are among the most crowded places in Dubai. Dubai's most crowded attraction, by far, is Dubai Mall. Located near the base of the world's tallest building (more on that in a minute), Dubai Mall attracted more than 80 million visitors in 2015, the latest year for which statistics are available. This means that nearly 220,000 people set foot in this mall each day, which is about 183 for each of the 1,200 stores you can find in this shopping center. Good thing this mall is highly air conditioned, otherwise being exposed to such crowded in a hot city like Dubai could get mighty uncomfortable! Fun fact: while Dubai Mall is the largest in the world by area, it's only number 19 in terms of the space that is leasable, on account of some of its square footage being occupied by waterfalls, ice skating rinks and aquariums. It's difficult to find official visitor statistics for the Palm Islands, the artificial islands that sit just off the coast of Dubai and are, not surprisingly, shaped like palm trees. Recent numbers for Palm Jumeriah, the largest and most popular of these islands, suggest a nightly population of between 9-11,000 tourists, which makes it slightly more popular overall than Burj Khalifa, and definitely one of Dubai's more crowded attractions, especially when you consider how narrow most of its roads are. Traffic is a major problem here, so when you drive onto the island you should consider staying for a while, whether voluntarily or otherwise. Another thing to be aware of is that while the Palm Islands are impressive when seen from space or atop any of Dubai's skyscrapers (more on those in a minute), their shape is not evident as you walk or drive on Palm Jumeriah. The Burj Khalifa is the world's tallest building, at least for now, with a height of 2,722'. While certain buildings in development will be higher when completed, it's unlikely any of them will be as popular as Burj Khalifa: It attracted 1.87 million visitors in 2013, which averages out to more than 5,000 amazed eyes per day. By contrast, the Saudi Arabian city of Jeddah (home to the under-development Jeddah Tower that's only a few feet taller than Burj Khalifa) receives fewer tourists overall per year than just this one Dubai building. To say nothing of the admittedly subjective aesthetic differences between the buildings, which are stark enough that it should be clear which one is more appealing. Just as Burj Khalifa sits near Dubai Mall, the Dubai Aquarium sits inside it, which makes this relatively small square footage of land disproportionately valuable to Dubai's tourism industry. While individual statistics for the Aquarium have been hard to come by in recent years, it's known that it attracted 1.5 million paid visitors during its first year (2011). It's almost certain, therefore, that at least 4,000 people per day marvel at the sea life on display here, some of which take advantage of the scuba diving options the aquarium offers, which include a "shark dive" that allows you to get up-close and personal with Sand Tiger sharks. Alternatively, you can have a "Mermaid Experience" although (spoiler alert) you don't actually become a mermaid. Given the fact that summer temperatures in Dubai regularly exceedd 120ºF, it might seem strange that a waterpark here would garner less than 1,000,000 annual visits. This is especially strange if you've ever been to the admittedly beautiful beaches in Dubai, whose scorching sands and bathwater-like temperatures make them slightly less than refreshing. Many tourists would prefer to relax inside the air conditioned lobby of the Burj Dubai, rather than sweltering and suffering on nearby Jumeriah Beach! On the other hand, 2,400 visitors per day is nothing to sneeze at, especially when you consider that figure in light of all the other popular, crowded Dubai attractions on this list, water-based ones and otherwise. The relatively low number of visitors Dubai's most popular water park attracts might be surprising, but the fact that you can ski literally in the middle of the desert is downright bizarre. OK, so Ski Dubai doesn't technically take place in the desert, given that it sits inside a heavily air-conditioned, decidedly artificial environment. Still, it's rather remarkable that three quarters of a million people choose Dubai as a ski destination every year, given how rare snow is in most of the Middle East. Indeed, the very existence of Ski Dubai is a testament not only to the power of Dubai attractions to motivate tourists to visit the city, but of the out-of-this-world engineering that underlies so many of Dubai's most crowded attractions. It's difficult to properly characterize Jumeriah Mosque as one of Dubai's most crowded attractions, given that no statistics exist for this holy place. It makes sense, of course, that mosque authorities wouldn't keep count, given that this is an active place of worship, not just a tourist attraction. Still, it's without a doubt the best-known mosque in Dubai, and since the city's fame largely derives from its new architecture as opposed to its old, the mosque has more than earned its place on the list. Other honorable mentions for crowded Dubai attractions that are also historical sites include the Dubai Old Souk market and Dubai Heritage Village, which takes visitors back into the city's past.